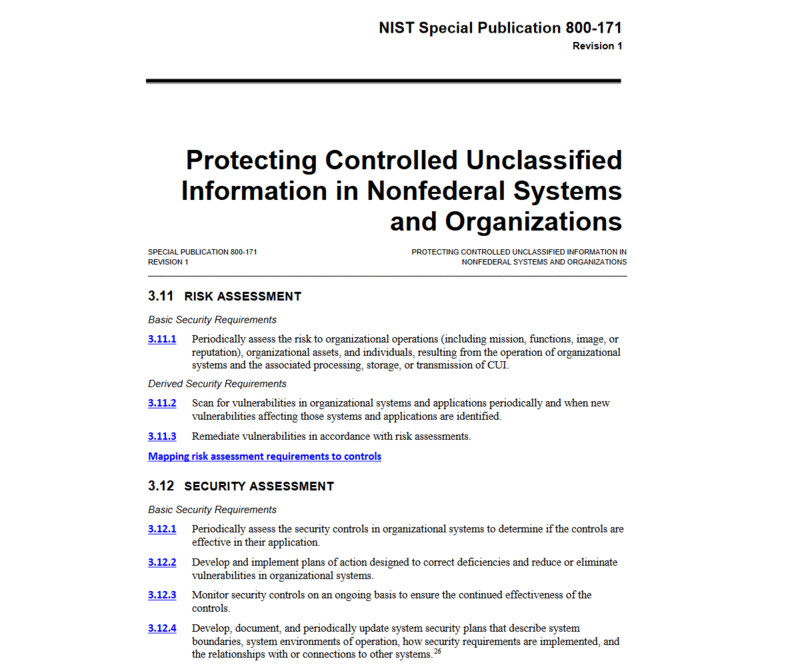 This document was updated and created to protect CUI – Controlled Unclassified Information for all government entities. So if you want to have a contract with the government you better have a plan in place. Due to Executive order 13556 (Nov 4, 2010), Controlled Unclassified Information program to standardize unclassified information and designated the NARA (National Archives and Records Administration). Interesting to note all this standardization comes from a long list of departments in charge of classifying information. But the reality is there are many things similar to standards like PCI, COBIT 5, and others. Assess security controls in the organization- are they effective? Develop and implement plans of action to fix deficiencies and reduce or eliminate vulnerabilities. Develop, document, and periodically update system security plans that describe system environments as changes occur, system environments, how they are implemented, and relationships to other systems. So essentially common sense security functions. Anytime a change occurs (new device, moving, adding, subtracting) one has to re-evaluate security posture. Periodically assess risk to organizational operations(mission, functions, image, or reputation), organizational assets, and individuals, resulting from the operation of organizational systems and the associated processing, storage, or transmission of CUI. Scan for vulnerabilities in organizational systems and applications periodically and when new vulnerabilities affecting those systems and applications are identified. Remediate vulnerabilities in accordance with risk assessments. So if you look at the document – it just means what all respectable requirements have. Document and inventory your stuff. June: 27 editorial changes and 5 substantive. Most of the changes were deletions and some clarifications. There is a change in authentication, now MFA(Multi Factor Authentication) is required instead of two-factor or regular password authentication. Above is the section (Identification and Authentication) where MFA is shown. If you need help in performing risk and security assessments Contact Us. Next Next post: Is There Cyber Risk? How to Assess Risk?